Purple and gold confetti raining down upon him, Kobe Bryant hopped up on the scorer's table, shook his fists and extended five fingers. When he hopped down, Boston's legendary Hall of Fame center Bill Russell was waiting to shake his hand. A Game 7 classic - and this time, it finally went the Lakers' way. Beating Boston for the first time in a Game 7, the Lakers came up champions again after trailing in the last quarter of the last game of their season. Kobe Bryant, the finals MVP, scored 23 points despite 6-of-24 shooting and the Lakers won their 16th NBA championship Thursday night, dramatically rallying to beat the Boston Celtics 83-79 in Game 7 of the NBA finals. Bryant earned his fifth title with the Lakers, who repeated as NBA champions for the first time since winning three straight from 2000-02. "This one is by far the sweetest, because it's them," Bryant said. "This was the hardest one by far. I wanted it so bad, and sometimes when you want it so bad, it slips away from you. My guys picked me up." Ron Artest added 20 points for the Lakers, who didn't show a champion's poise while making just 21 shots in the first three quarters, even hovering around 50 percent at the free throw line. Yet with Bryant driving the lane and Pau Gasol finally coming alive with nine of his 19 points in the fourth quarter, Los Angeles reclaimed the lead midway through the fourth quarter and hung on with a few more big shots from Gasol, who had 18 rebounds, and Artest, a first-time champion as the only newcomer to last season's roster. "Well, first of all I want to thank everybody in my hood," Artest said in an ABC interview right after the game. "I definitely want to thank my doctors ... my psychiatrist, she really helped me relax a lot." With their fifth title in 11 seasons, the Lakers moved one championship behind Boston's 17 banners for the overall NBA lead. Amid the confetti and streamers after the final buzzer, Magic Johnson rushed the court to congratulate Bryant, who now has the same number of titles, and to hug Artest, the only new addition to the Lakers' championship roster from last season. Artest has been a liability for much of the postseason, but the former head case came up with a remarkable game on the Lakers' biggest night, playing sturdy defense along with his scoring. Paul Pierce had 18 points and 10 rebounds for the Celtics, who just couldn't finish the final quarter of a remarkable playoff run after a fourth-place finish in the Eastern Conference. Kevin Garnett added 17 points, but Boston flopped in two chances to clinch the series in Los Angeles after winning Game 5 back home. "Listen, give the Lakers credit," Celtics coach Doc Rivers said. "They were terrific." Rivers knows changes are coming, even saying afterward that the '10-11 Celtics will be different than the '09-10 team. "We were the tightest, most emotional, crazy group I've ever been around in my life," Rivers said, adding that he'll wait a while before deciding on his oft-speculated future. He called this team "crazy close" and throughout the playoffs, the Celtics only got closer. Down by 14 in their first playoff game against Miami, they won that night and rode that instant burst of confidence not only past the Heat, but through Cleveland and Orlando in the next two rounds. The Celtics were a .500 team for the final two-thirds of the season, prompting many to wonder if they could turn it back on for the playoffs. That question was answered long ago. Yes, they could - and one or two more stops on Thursday, they'd have won an 18th title. "There's a lot of crying in that locker room," Rivers said. "A lot of people who care. I don't think there was a dry eye. A lot of hugs, a lot of people feeling awful. That's a good thing. Showed a lot of people cared." After three quarters of mostly terrible offense, the Lakers tied it at 61 on Artest's three-point play with 7:29 left. Bryant's free throws 90 seconds later gave the Lakers their first lead of the second half, and the Lakers went up by five points before Bryant and Sasha Vujacic hit free throws in the final seconds to keep Los Angeles ahead. Bryant said he had to downplay the magnitude of the rivalry during the series, but it was a gigantic part of his motivation for this title, without question. Because it was Lakers-Celtics, the best rivalry in league history. And because it was against the team that denied him a title in 2008, the Celtics then blowing out the Lakers in Boston in Game 6 two years ago for their 17th championship. That loss drove Bryant all last season, and drove him again Thursday night. He was not at his best in Game 7, and acknowledged as much. Didn't matter - he still captured the finals MVP award, after averaging 28.6 points in the series. He's won three straight crowns before, and is already eyeing another three-peat try. "Let's go for it again," Bryant said, moments before hoisting the finals MVP trophy. The Lakers will relish this title because they took it from the Celtics, their greatest rivals, with fourth-quarter poise and defense. The teams have met in 12 NBA finals, but the Lakers won for just the third time. Exactly two years to the day after Boston beat the Lakers by 39 points to clinch the 2008 title, Los Angeles got revenge for perhaps the most embarrassing loss of Bryant's career - even if he did little more than grab 15 rebounds for most of the night. But forget how it looked, because history will. Bryant even did something Jerry West and Magic Johnson never could: He beat the hated Celtics in Game 7 of the finals. The Celtics had never lost a seventh game in the finals. Despite nursing a lead through most of the night while holding the Lakers to ridiculously low shooting percentages until the final minutes, Boston couldn't close it out on the coast, becoming just the seventh team to blow a 3-2 finals lead after winning Game 5. Los Angeles had lost a seventh game to Boston four times previously - but those teams didn't have Bryant, who's just one title shy of Michael Jordan's six rings after winning his second title without Shaquille O'Neal, his partner in the first three. 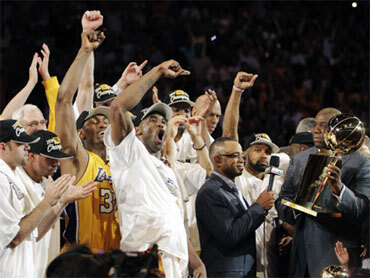 With that fourth-quarter escape act, Bryant and fellow five-time champion Derek Fisher even earned the right to celebrate a title at home for the first time since winning their first rings in 2000. Lakers coach Phil Jackson won his 11th title overall, his fifth in Los Angeles - and perhaps the last for the winningest playoff coach in NBA history. Weary of the regular-season grind and facing a likely pay cut with the Lakers, Jackson hasn't determined his future, though he previously said another title would make him more likely to chase an unprecedented fourth threepeat next season, when he'll be 65. "I got to take a deep breath. I got to take some time to think about this," Jackson said. "This was great I'll wait to make that decision in a week." With his hands already full, maybe Jackson will follow Russell's lead and put that 11th championship ring on a chain around his neck - and Bryant isn't likely to settle for just one handful of rings. He made that clear Thursday night. "He knows how bad I want him back," Bryant said. "I've been openly blunt about how much I want him back." The Celtics had much more poise from the opening tip in Game 7, playing vicious defense that forced Los Angeles to miss 21 of its first 27 shots. Bryant and Gasol were a combined 6 for 26 in the first half while the Lakers made just 26.5 percent of their shots, and only Ron Artest's 12 points and relentless effort kept the Celtics' halftime lead to six points. The Lakers are the first team to rally from a 3-2 deficit to win a finals since Houston did it in 1994, beating the New York Knicks. Boston did it twice to the Lakers, including an infamous 1969 finale in which thousands of celebratory balloons never were released from the Forum rafters in Inglewood. Staples Center had no such problems, unleashing a downpour of streamers and confetti when the Lakers finally finished it off. Although Los Angeles stumbled to the brink of elimination for the first time in these playoffs last weekend in Boston, Bryant's teams still are spectacular finishers: They've closed out their playoff opponents on the first try 10 times while winning three straight Western Conference titles over the last three years. Bryant further cemented his place in the NBA's highest circles by leading the Lakers to back-to-back titles, something no other NBA superstar has accomplished since he and O'Neal did it nearly a decade ago. He also picked up a unique bit of Lakers credibility by sending home the Celtics in a Game 7, which West failed to do in three tries and Johnson couldn't manage in 1984. NOTES: Home teams improved to 14-3 in Game 7 in the finals. No road team has won a title in Game 7 since 1978. ... The Lakers are 14-1 in a seventh game at home, losing only the 1969 finale to Boston. ... Garnett nearly flattened Jack Nicholson when he chased a loose ball into the front row in the second quarter, but the Lakers' most famous fans got back up smiling. Other fans near courtside included Jake Gyllenhall, Kirsten Dunst, Ryan Seacrest, Timbaland, director Todd Phillips and George Lopez in purple-and-yellow plaid pants.